It gives us great pleasure to announce that, for the third year running, we have been named as one of the UK’s fastest growing technology companies in the 2016 Deloitte Technology Fast 50. We are also the only FinTech firm to make the list in each of the last three years, based on revenue growth, of 336% from £13 million in 2012 to £56.7 million in 2015. Our saving and investing technology is used by close to 20% of all UK financial advisers and by approximately two million consumers, who have embraced our ideology of making investing easier with effective FinTech solutions. We are administrators of more than £52 billion of clients’ investments, ensuring we always seek the most robust, technology enabled, solutions for our clients. We partner with some world’s largest fund managers, including UBS Asset Management, Goldman Sachs, Allianz, Columbia Threadneedle, Schroders, SEI, Close Brothers and 7IM and have pioneered our strategy for Advanced Diversification in our True Potential Portfolios. increased the volume of assets on our investment platform to £4.6 billion. We also continue to break new ground with our micro-investing solution, impulseSave® as our world-first investment top-up technology is on course to see £60m of new money invested by the end of 2016. George Peebles and Neil Johnson collecting the award. 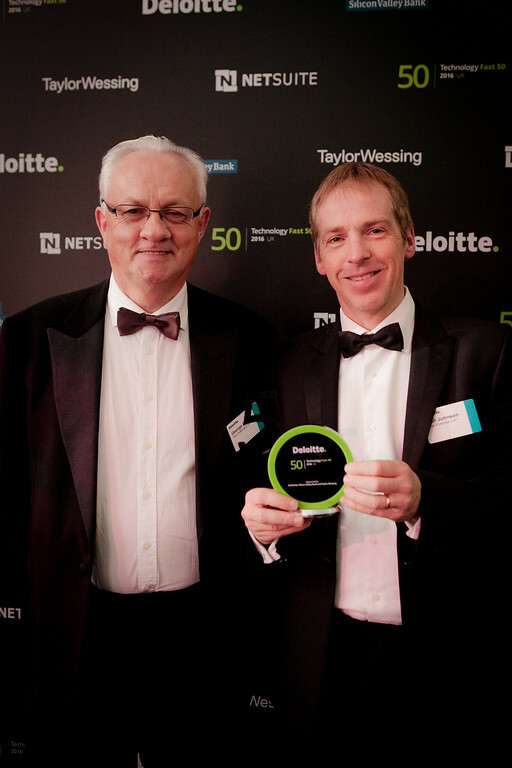 Neil Johnson, Senior Partner at True Potential, said: “Making it into the prestigious Deloitte Fast 50 for three years in a row is an outstanding achievement. I put our success down to the way we do business because we remain very entrepreneurial and nimble. We’re incredibly grateful for this accolade, which has been the product of hard work and our ability to behave dynamically as a business. We take a forward-looking view, leading with innovation, and we continue to seek to outperform ourselves, year on year.